odorless, tasteless, transparent liquid that is colorless in small amounts but exhibits a bluish tinge in large quantities. It is the most familiar and abundant liquid on earth. In solid form (ice) and liquid form it covers about 70% of the earth's surface. water in the solid phase; there are ten known crystal modifications of ice, as well as amorphous ice. 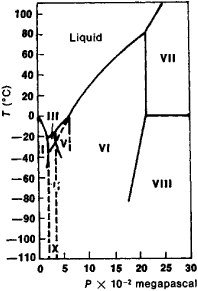 Figure 1 shows the phase diagram of water, which indicates the temperatures and pressures at which the various modifications are stable. The best-known modification is ice I (see Tables 1 and 2), which is the only modification found in nature. Ice is found in nature in the form of ordinary ice (continental, floating, subterranean, and other varieties), and as snow and frost. Natural ice is usually considerably purer than water, since the solubility of materials (except NH4F) in ice is exceptionally poor. Ice may contain physical impurities (solid particles, droplets of concentrated solutions, and gas bubbles). The saltiness of sea ice is due to the presence of salt crystallites and brine droplets. The total deposits of ice on earth are about 30 million cu km. There is evidence concerning the presence of ice on planets in the solar system and in comets. The main ice deposits on earth are concentrated in polar regions (mainly in Antarctica, where the thickness of the ice layer is as great as 4 km). a power equation, the power index increases with increasing stress. In addition, the rate of flow is directly proportional to the energy of activation and inversely proportional to the absolute temperature, so that ice approaches an absolutely rigid body with decreasing temperature. The average flow rate of ice at temperatures close to the melting point is 106 times higher than that of rock. Because of its fluidity, ice does not accumulate indefinitely but rather flows down from the areas of the earth’s crust in which the rate of accumulation exceeds that of melting. Because of the very high reflectivity of ice (0.45) and particularly of snow (up to 0.95), the surface covered by them—an annual average of 72 million sq km at high and medium latitudes of both hemispheres—receives 65 percent less than the normal quantity of solar energy. This is a powerful source of cooling of the earth’s surface and to a considerable degree is responsible for the latitudinal climatic zones. During the summer, solar radiation is more intense in the polar regions than in the equatorial belt, but the temperature remains low, since a significant quantity of absorbed heat is expended on the melting of ice, which has a very high latent heat of fusion. Ice II, III, and V may be preserved for long periods of time at atmospheric pressure if the temperature does not exceed — 170°C. Heating to about — 150°C transforms these modifications into cubic ice (ice Ic), which is not shown in Figure 1 because it is not known whether or not it is a stable phase. Another method for the preparation of ice Ic consists in the condensation of water vapor on a substrate cooled to — 120°C. Condensation of vapor on colder surfaces leads to the formation of amorphous ice. Both of these forms of ice may undergo spontaneous transition to the hexagonal ice I, in which case the transition rate accelerates with increasing temperature. Ice IV is a metastable phase in the range of stability of ice V. It forms readily and may be stable if heavy water is subjected to pressure. The melting curve of ice VII has been studied for pressures up to 20 giganewtons per sq m (GN/m2), or 200,000 kilograms-force per sq cm (kgf/cm2). Ice VII melts at 400°C at this pressure. Ice VIII is a low-temperature, more highly ordered form of ice VII. Ice IX is a metastable phase generated by supercooling of ice III and is essentially a low-temperature form of it. Phenomena of supercooling and metastable equilibrium are generally very characteristic of the phases formed by water. Some lines of metastable equilibriums are shown by dotted lines in Figure 1. The polymorphism of ice was discovered by G. Tammann (1900) and studied in detail by P. Bridgman (beginning in 1912). The phase diagram of water developed by Bridgman has been revised and amended several times since the 1960’s. Data on the structure of modifications of ice, as well as some of the properties of the modifications, are given in Tables 3 and 4. The crystals of all modifications of ice consist of water molecules (H2O) joined by hydrogen bonds into a three-dimensional framework (Figure 2). Each molecule participates in the formation of four such bonds, which are directed toward the apexes of a tetrahedron. In the structures of ice I, Ic, VII, and VIII the tetrahedron is regular—that is, the angle between the bonds is 109°28’. The high density of ice VII and VIII is explained by the fact that their structures contain two three-dimensional networks of hydrogen bonds (each of which is identical to the structure of ice Ic), one inside the other. The tetrahedrons in the structures of ice II, III, V, and VI are appreciably distorted. Two intersecting systems of hydrogen bonds may be identified in the structures of ice VI, VII, and VIII. Data on the positions of protons in various ice structures are less conclusive than data on the positions of oxygen atoms. It may be concluded that the configuration of water molecules characteristic of steam is retained in the solid state (the O—H distances apparently increase somewhat because of the formation of hydrogen bonds), whereas the protons tend to be positioned closer to the lines connecting the centers of oxygen atoms. Thus, six more or less equivalent orientations of water molecules with respect to their neighbors are possible. Some of these orientations are excluded, since the simultaneous presence of two protons at the location of a hydrogen bond is improbable, but a definite uncertainty remains concerning the orientation of water molecules. This uncertainty applies to most of the modifications of ice—I, III, V, VI, and VII (and apparently, Ic)—so that according to the expression of J. Bernal, ice is crystalline with respect to the oxygen atoms but glasslike with respect to the hydrogen atoms. The water molecules are orientationally ordered in ice II, VIII, and IX. Ice in the atmosphere, in water, on the surface of land and water, and in the earth’s crust exerts a great influence on the environment and vital activity of plants and animals and on various types of human economic activity. Ice may generate various natural phenomena with harmful or destructive consequences (icing of aircraft, ships, structures, roads, and soil; hail, blizzards, and snowdrifts; river blockages and jams with flooding; avalanches; and breakage of plant roots resulting from the formation of layers of ice in the soil). The prediction, identification, and prevention of harmful phenomena, the control of their effects, and the use of ice for various purposes (snowdrift control, construction of ice crossings and isothermal storage areas, lining of warehouses, and ice-lining of mine shafts) are the subjects of various branches of hydrometeorological and engineering science (ice and snow engineering; engineering applications of soil freezing studies) and of various service activities (ice reconnaissance, icebreaker transport, snow-removal services, and artificial provocation of avalanches). Some types of sports use ice rinks with artificial refrigeration, which make possible the conduct of competitions on ice during warm seasons and in enclosed areas. Natural ice is used for the preservation and storage of foods, as well as biological and medicinal preparations; it is produced and prepared for these purposes. Shumskii, P. A. Osnovy strukturnogo ledovedeniia. Moscow, 1955. Eisenberg, D., and W. Kauzmann. The Structure and Properties of Water. Oxford, 1969. Fletcher, N. H. The Chemical Physics of Ice. Cambridge, 1970. What does it mean when you dream about ice? Ice often symbolizes the dreamer’s emotional state. The dreamer may not be conscious of being blocked or frozen emotionally. Falling through the ice suggests the dreamer may be “skating on thin ice” and should alter course to avoid mishap. The dense substance formed by the freezing of water to the solid state; has a melting point of 32°F (0°C) and commonly occurs in the form of hexagonal crystals. A layer or mass of frozen water. Abbr. for the “Institution of Civil Engineers, ” London. (1) (Information and Content Exchange) A data syndication protocol that allows one website to obtain content from another website. Based on XML and meta tags, ICE provides a standard for subscribing to content. See XML, meta tag and syndication format. (2) (In-Circuit Emulator) A chip used for testing and debugging logic circuits typically in embedded systems. The chip emulates a particular microprocessor and contains breakpoints and other debugging functions. See ROM emulator. (3) (In Case of Emergency) A cellphone entry stored under the name of "ICE" that contains an emergency contact number and other medical information. It was recommended by a British paramedic, and a campaign for public awareness was launched in the U.K. in 2005. See emergency app. (4) (Ice) A Lotus 1-2-3 add-on from Baler Software Corporation, Rolling Meadows, IL, that added extensions to Lotus macros. (5) (Image Correction and Enhancement) See Digital ICE. Ice, or water in the solid form, is associated with the emotions and the unconscious. Dreaming about ice suggests that you may have some emotions or denied psychological issues that are not readily accessible to you. These feelings may be negative (i. e., fear and anxiety about death or sexual frigidity). Things that are frozen are generally not usable and they do not change or grow. This dream may be pointing to feelings or thoughts that are inaccessible to you or to that part of you that is inaccessible to others. Superstition based dream interpretation books tell us that sitting on ice in your dreams is a dream of the contrary . It indicates that you may have a life of comfort and prosperity (this is may be silly to some but others like to hear these type of interpretations! ).